Camp Cool Kids is a perfect movie for the whole family! Summer is the best time of the year for kids. We are out of school and the best kids’ movies play. I love that while I watched Camp Cool Kids, I came up with quite a few ideas on what to do for entertainment this summer. I can go outside and have fun with my family and friends. This is one of the many fun, eye-catching things that makes Camp Cool Kids so enjoyable. I love that it includes all different kinds of sports such as swimming, rock climbing, paintball and archery. Every sport has its own scene and that is something that I really enjoyed. I was able to get a glimpse of each sport and see how they are played at summer camp. I have to say that my favorite scene would be where all the boys have a paintball war. It is hilarious and I couldn’t stop laughing. Camp Cool Kids is somewhat religious based. They mention David and Goliath and other Bible stories. Grandpa Norman (Michael Gross) tells David’s tale and how he took on Goliath all by himself. His faith in God is what helped him through that journey. The storyline is somewhat quirky and, although it’s not new, it does have a few twists and turns along with a new perspective. Spencer (Connor Rosen), my favorite character, is a shy, honest, goodhearted kid that wants to stay at home and be with his family during the summer. Grandpa Norman (Michael Gross) says it is time for Spencer to go to summer camp and make new friends. His older brother Dean (Sean Ryan Fox), the handsome, cool kid who seems like he has it all, goes to summer camp to make friends and meet girls. Shy Spencer goes a long way from home and off to Camp Cool Kids for the summer, against his wishes. Spencer meets many new friends that he will remember forever such as the adorable Tater (Jacob T. Phillips), his lovable twin Tot (Jordan A. Phillips), the man whose has got the fire, nickname Firefly (Tyree Brown) and the quirky, always-there-for-you kind of friend, Little John (Juliocesar Chavez). Spencer also makes a new enemy as well, Zach (Logan Shroyer), the cute but not-so-kind villain. Zach and Dean become friends and amuse themselves by pulling a prank or two on the younger boys including Spencer, his brother. There are lots of pranks and silly fun in this adventure. I recommend this for ages 7 to 18. Kids will love the idea of summer camp and will want to try some of the events. Adults will have memory flashbacks. It is full lessons, humor and heartfelt moments. I give this 4 ½ out of 5 swimming campers’ fun tale. John James Audubon was one of the most remarkable men of early America. A contemporary of Lewis & Clark and Davey Crockett, he explored the American frontier in search of “the feathered tribes” he loved and studied. A self-taught artist and ornithologist, he left a legacy of art and science that made him famous in his lifetime and endures to this day. His portrait hangs in the White House, his statue stands over the entrance to the American Museum of Natural History, and his name was adopted by the nation’s first conservation organization. The program, filmed in locations where Audubon painted, brings to life his timeless paintings with dazzling footage of the living birds he immortalized and celebrates visually the natural world he described in his writings. Interviews reveal the man, explore his art and put his groundbreaking work in modern perspective. KIDS FIRST! Juror, Eli B. comments, “Audubon is such a great film about the life and contributions of John James Audubon. His struggle and journey as a Haitian immigrant to the United States of America is inspiring. The paintings he created forever immortalized the subjects (some of which are now extinct) and the research he did ultimately led to our nation’s first conservation organization.” See her full review below. This documentary gives an in-depth history of the life of John James Audubon. There are many examples of his beautiful works of art, maps charting his journey from Haiti to America and excerpts from the journals he kept throughout his life. 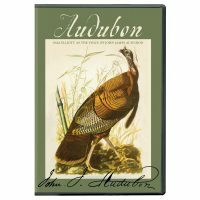 This DVD offers a great way to teach anyone about John James Audubon. The art and story telling is not only beautiful and interesting, but important scientifically and in regards to American history. The film flows well with great detail and historical accuracy. The material is easily understood and, after scientific elaborations, often a more simplified explanation is given. John James Audubon was a man of incredible talent and fortitude. He faced many challenges such as childhood abandonment, adult poverty and immigration during the 1800s. The film wonderfully details not only his countless contributions to art, science and conservation, but the challenges he faced and surpassed are an equally important part of his story. This film will prompt many questions regarding many topics! Throughout it, Audubon’s travels are documented on a virtual map. The map brings about questions regarding geography, immigration, cultural differences, animal species of North America and many other topics that appeal to many age groups. The film has great visual appeal. It is filmed in locations where Audubon painted and, throughout it, these works are shown in all their glory. Selections of Audubon’s original journal entries are seen for the first time in this film as well. The cover of the DVD and the CD have iconic Audubon images titled “Wild Turkey” and “The Great Horned Owl”. This offers the option of viewing the 90 minute theatrical version or the 60 minute broadcast version. English subtitles are available. Scene selection is not available, but you can pause, rewind or fast forward as necessary. Audubon is such a great film about the life and contributions of John James Audubon. His struggle and journey as a Haitian immigrant to the United States of America is inspiring. The paintings he created forever immortalized the subjects (some of which are now extinct) and the research he did ultimately led to our nation’s first conservation organization. This film will prompt many questions regarding many topics including birds, painting, hiking and travel, American history in the early 1800s and more. The message of this film is in its detailed historical look at the life and contributions of John James Audubon to art, science and Conservation. I give this 5 out of 5 stars and recommend it to ages 8 to 18, plus adults. Audubon will be available on DVD June 20, 2017. Reviewed by Eli B., KIDS FIRST! Juror. The Resilient Heart explores the keys to preventing heart disease on a worldwide scale. At the film’s core is the story of Dr. Valentín Fuster, a world-renowned cardiovascular scientist, and Director of Mount Sinai Heart and Physician-in-Chief at The Mount Sinai Hospital. Through his exploration of the heart at the molecular level, Dr. Fuster discovers that the real answer to defeating chronic disease lies in a much larger place: early education. By highlighting scientific contributions ranging from basic science to translational research, the film addresses the improvement of clinical and surgical care efforts to promote lifestyles that prevent or slow the progression of heart disease. Ultimately, it shows how the intersection of science, medicine, research, education and compassion bring about changes that are not only important but also replicable by physicians and patients throughout the world . The film follows Dr. Fuster and his team as they travel to Eldoret (Kenya), Bogota and more. If you or someone you know has ever been touched by a heart disease, you really must see this film. This inspirational film kept me glued to the edge of my seat. I didn’t know that heart disease is the number one killer in society today. It fascinates me that there are incredible individuals in this world such as Dr. Valentin Fuster who want to make a difference in the lives of others, especially with a disease that is so common. In this documentary promoting worldwide heart health, we see cardiologist Valentin Fuster working with doctors around the globe to help individuals realize that behavior is the key to combating heart disease. Traveling to countries like Kenya, Colombia and Grenada, Fuster works with both children and adults to help facilitate healthy behavior, through group therapy sessions, classroom instruction and community volunteering. Valentin Fuster has the biggest heart. He flies to other countries once a week to help people. He gets up at 4:30 every morning, works 7 days a week and works with kids for 15 years to help them understand the benefits of a healthy lifestyle. I wish I could meet him, because I would love to thank him for all of the incredible work he has done for kids and adults around the world. I really admire that the film is not based in a single geographical location. It is fascinating to see different cultures and compare them, and see how heart disease affects poor countries, which most people are not aware of. The fact that I was able to see how different areas of the world need so much help from future generations motivates me to follow in Fuster’s footsteps – first starting in my own community, then making my impact even bigger. My favorite part of this film is when Dr. Fuster talks about his motivation and says that if he died tomorrow, he would be okay with it, because he has helped so many people. This is rewarding to him. The message of this film is that we have the power to keep our hearts healthy. You can start focusing on heart health at any age and, although we can’t necessarily cure heart disease, we can prevent it by exercising, eating right and avoiding incredible amounts of stress. I give this film 5 out of 5 stars and recommend it to kids ages 12 to 18. Adults would love it too. No age is too young to begin taking care of your heart. You can watch this film on Amazon now! This is the documentary of a lifetime. You are currently browsing the KIDS FIRST! Jury Blog weblog archives for July, 2017.